Today it has been announced that Disney have bought Lucasfilm Ltd. from George Lucas for a reported $4.5 Billion. A new Trilogy of Star Wars movies has also been announced by Disney, with the first, Star Wars Episode 7, targeted for release in 2015. This blockbuster deal will see Lucas become a creative consultant for new Star Wars projects. Kathleen Kennedy, currently Co-Chair of Lucasfilm will become brand manager of this global Sci-Fi franchise as well as President of Lucasfilm. Disney has not only acquired the studio, and properties, but also the award-winning ILM and Skywalker Sound effects departments. 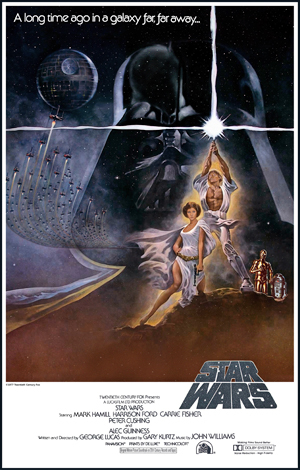 The saga that began in a galaxy far, far, away in 1977 is one of the most successful movie franchises of all time, and looks set to return in the near future with prehaps its most exciting Trilogy ever. Just when we thought the story of Star Wars was all said and done, it looks like we are about to witness the start of a brand new chapter. Now go strap yourself in and get ready for the jump to lightspeed in 2015! For A Wonderful Team Member Appreciation Award! In the space of only two weeks I’m very happy to tell you that my Blog: Sci-Fi Jubilee has been nominated for another Blog Award! 1. 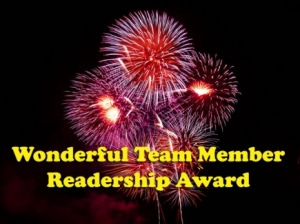 The Nominee of the Wonderful Team member Readership Award will display the logo on his/her post/page and/or sidebar. Here are the questions for me & the Blogs that I nominate. My Blog started out as just a hobby, but in a short space of time it has become something I really enjoy doing. I love writing and getting feedback from my readers. I have a lot of fun putting the articles together, and look forward to thinking up new ideas all the time. Well the book I would like to take is The Lord of the Rings (Would like to have the whole Trilogy with me if I could, but if it had to be just one book then The Fellowship of the Ring is my favourite). The DVD would be Alien, I always enjoy watching that film so much. I am a big fan of cartoons and my favourite character has always been The Road Runner. As for a game, well the one I liked best for as long as I can remember is Cludo. So I guess I my answer really should be: The Alien murdered the Road Runner on the Desert Island with the one ring to rule them all! Best one-liner in a superhero movie ever: We have a Hulk! 4) What is your favorite thing about yourself? Daydreamer… Sorry, what did you say? Now for my nominations. I follow a lot of blogs on WordPress & Twitter, hope you all enjoy the Blogs I nominate. Be sure to check them out. Cheers everyone! Ian Fleming’s secret agent James Bond has enthralled generations of moviegoers over the last five decades. The series began with the genre defining performance by Sean Connery as Fleming’s secret agent, George Lazenby‘s tenure was short lived, giving way to Roger Moore’s raised eyebrow and innuendoes laden scripts, Timothy Dalton took a walk on the dark side with his emotionally scarred Bond, until Pierce Brosnan’s roguish charm saw a renascence for the series before the licence to kill was summarily passed over to the athletic physicality of Daniel Craig’s Bond. Now 007 is back in his 23rd film Skyfall, Daniel Craig’s third assignment as James Bond, and just in time to celebrate the 50th Anniversary of the worlds longest running movie franchise that began with Dr.No in 1962. When 007’s mission in Istanbul goes badly wrong, Bond is left fighting for his life. With Bond missing and presumed dead, M is left to deal with the fallout from the serious breach of security that has leaked the identities of every undercover agent currently embedded within various terrorist organizations around the world. Bond returns, he must work to rebuld himself mentally and physically, but he endeavours to help M no matter how personal the cost may be. The city of London and MI6 comes under attack as old secrets and vendettas come to the fore as Bond crosses the globe to track down the villainous Silva – a man determined to avenge himself for the role M played during his past – taking in Shanghai and Macau, before a stunning climax in the Scottish Highlands. Skyfall is an action packed extravaganza from beginning to end, the story and pace never lets up for a moment, and the incredible locations and direction by Sam Menders all help to make this Daniel Craig’s most definitive version of Bond since his tremendous debut in Casino Royal (2006). The opening pre-credits sequence with the amazing chase through the streets of Istanbul that ends up with Bond on the roof of a speeding train is one of the series most exhilarating to date, and the brutal fight sequences in Shanghi are as bone crunching as we have come to expect from this reinvigorated franchise. 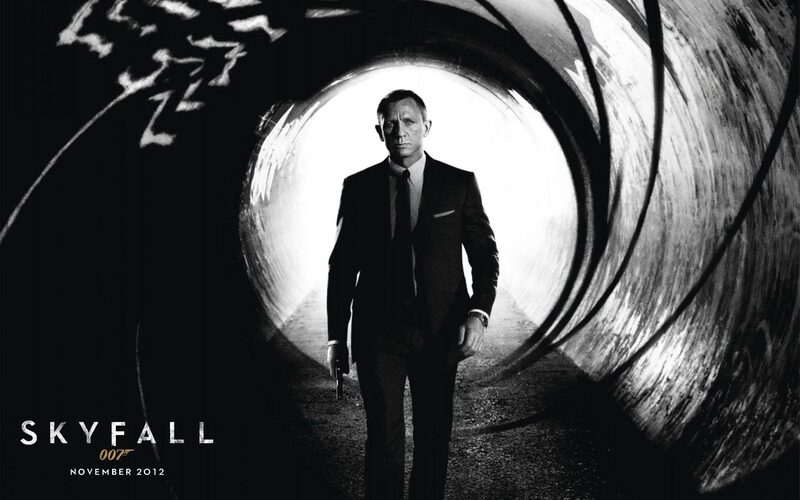 A large section of screenwriters Neal Purvis, Robert Wade, and John Logan’s plot in Skyfall revolves around events in the UK, with Bond prowling the streets of capitol, including an spectacular chase through the London Underground. No Bond movie would be complete without a Bond Girl to catch 007’s eye, and Skyfall has not one, but two leading ladies to keep our hero on his toes. He gets up close and personal with the glamorous Severine (Bernice Marlohe) in a Casino in Macau and is also teamed up with field agent Eve (Naomie Harris). Bernice Marlohe has a steamy encounter with Daniel Craig’s Bond, and the mysterious Severine certainly gives 007 a run for his money. Naomie Harris also acquits herself well as Eve, and gets a good slice of the action as Bond’s ambitious sidekick. The villain of Skyfall is the cunning Raoul Silva, played by Spanish star Javier Bardem, who is more than a match for Bond as he plots M’s downfall. Bardem makes Silva one of the most menacing adversaries Craig’s 007 has encountered so far, and his vendetta against M also gives Skyfall some great character defining moments for Bond and M.
One very special facet of the 007 films that makes a welcome return in Skyfall are the gadgets, most notably the Walther PPK 9mm handgun coded to Bond’s palm print, all supplied by MI6’s inventor of weapons and field equipment Q. This is the first time the part has been played by someone younger than Bond himself, Ben Whishaw, who has also worked with Daniel Craig before on Layer Cake and Enduring Love. Ben Whishaw has some great scenes with Bond, his role is a nice homage to the wonderful Desmond Llewelyn who famously made the role his own across 17 Bond films, and it is fitting that the character should return for a new audience to help celebrate 007’s 50th Anniversary. Ralph Fines also joins the all-star cast of Skyfall as Mallory, Chairman of the Intelligence and Security Committee heading Westminster’s investigation into M’s competency, along with aspiring new rival Clair Dowar (Helen McCroy). Judy Dench has much more to do as M this time around, every scene Dench shares with Craig’s Bond is electrifying – particularly when she finds Bond waiting for her in the shadows of her apartment. Indeed, M’s relationship with Bond is pushed to the limit in Skyfall as her past returns to haunt her, and Daniel Craig once more dominates every scene as he smoothly shifts between 007’s perfectly understated menace and ruthless efficiency. A marketed improvement over 2008’s somewhat muddled entry, Quantum of Solace, Skyfall takes everything that fans have come to expect from Daniel Craig’s era as James Bond and makes it even better than before. 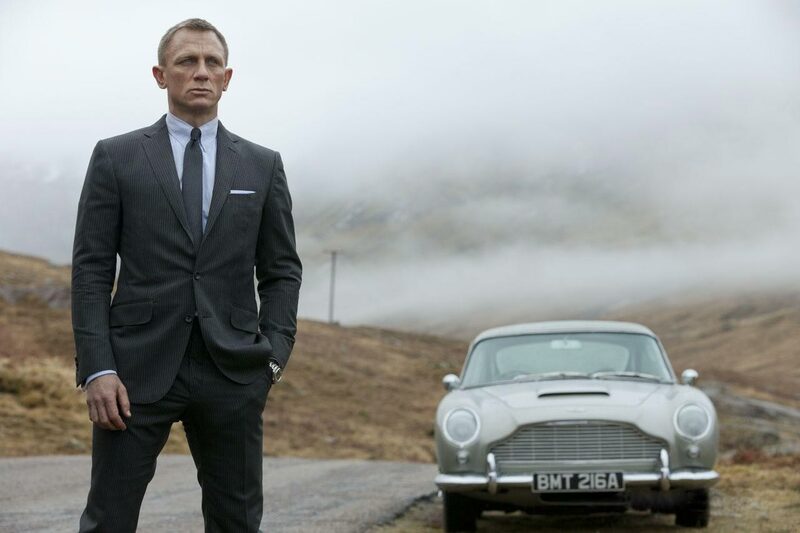 The action is super slick and brutally choreographed, Bond’s iconic Aston Martin DB5 also returns, the theme tune by Adel is one of the best yet, and there are enough snappy one-liners and gadgets to keep fans on the edge of their seats. 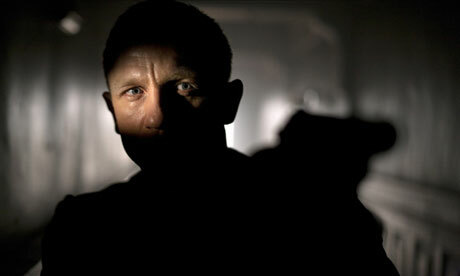 A brilliant film, quite possibly one of the best Bond films ever made, and highly recommended. The Flash #0 sees DC’s innovative Zero Month drawing to a close, and Francis Manapul and Brian Buccellato take full advantage of the opportunity to really give a new spin on the origin of The Fastest Man Alive. By resurrecting some elements from events before Flashpoint this issue tackles the murder of Barry Allen’s mother by Professor Zoom in the old DCU, which left Barry’s father, Harry, framed for his wife’s murder. The re-launch of the DC range during the New 52 effectively discarded this storyline, so the Flash #0 goes some way to redressing the balance within the context of the newly established continuity. The story jumps backwards and forwards in time between Barry Allen visiting his father in prison and his own recovery in hospital after the accident in his lab that gave him his newfound powers of the speed force. The lightening that struck Barry through the window somehow charged the chemicals in the lab, causing them to explode all around him. Badly burnt, Barry falls into a coma where experiences the events in his childhood between his estranged parents that led up to his mothers mysterious death after he won first prize in a spelling contest. 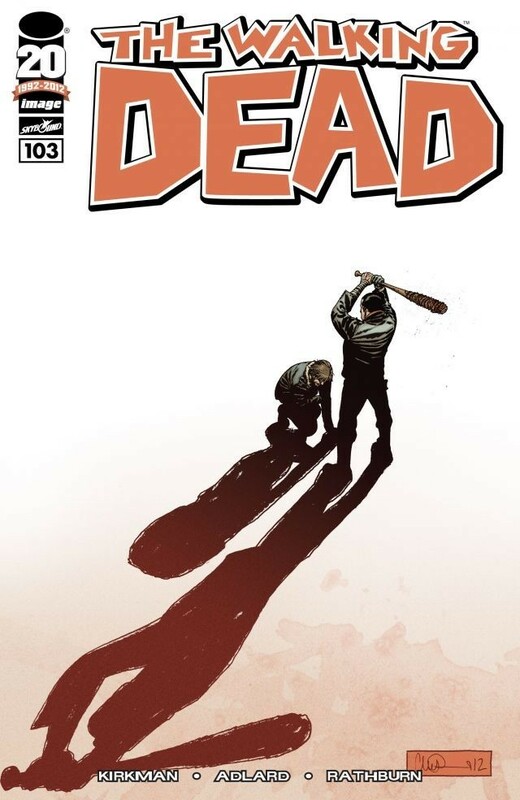 The present intermingles with Barry’s memories as a child, we see Barry experience the shocking discovery of his mother’s body, and we learn how the Police Officer at the murder scene took Barry in and looked after him when his Father was imprisoned for her murder. His tireless quest to prove his father’s innocence invariably proves to offer at least some hope of closure, but as Barry’s burns heal at an astonishing rate, his speed powers emerge, shocking him out of his coma and into the life of a super powered hero. I have really enjoyed Manapul and Buccellato’s run on this series, the art really conveys the sense of The Flash’s incredible powers, at times you almost feel like you are running alongside him as he races from page to page – and they even find time to show how Barry created his new costume! 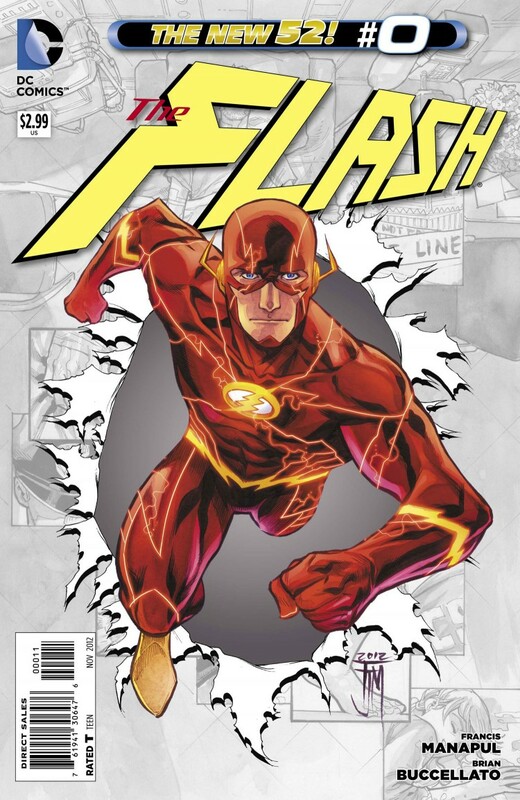 Flash #0 is their most accomplished issue to date; it fleshes out the character of Barry Allen, as well as offering up a more realistic slant on the “traditional” origin story. This has been once of my favourite titles from The New 52, and I’m looking forward to seeing what Francis Manapul and Brian Buccellato have in store for the year ahead. Sci-Fi Jubilee Has Been Nominated For A Reader Appreciation Award! 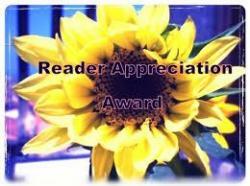 I was really excited to get nominated for a Reader Appreciation Award by my fellow blogger Loki Lou & her Blog The Modfather I haven’t been doing Sci-Jubilee for very long, so it was really nice to get nominated for an award so soon. The rules of this award means there are a few things I have to do. First off I need to nominate 15 blogs for this award. Then I have to answer 10 questions that have been posed by the person who nominated me. Finally I have to ask 10 questions to the blogs I choose to nominate. 1.If you could live anywhere in world where would it be? And why? Humm, well I love the UK, so don’t think I would ever leave it unless I won a squillion quid on the Lottery. If I could go anywhere in the world and live I think I would choose New Zealand. Why? Well, I think it has something to do with The Lord of the Rings films. The scenery was stunning in those movies, so guess I like the idea of exploring such a fantastic place. Well, I’ve only just got a Kindle, so at the moment I’m kind of torn between them. I’m starting to use it a lot more, but I still like reading actual books best at the moment. I expect I always will really. The 4th Doctor is my favourite (Tom Baker) so it would be great to go on some adventures in the TARDIS with him, Romana, and K9! That would be so awesome! Gary Oldman is a brilliant actor, so I would have to choose him. His performance in Dracula was so mesmerising, he was also fantastic in Leon, and has been great as Jim Gordon in all the new Batman films. 6. If you could invite 5 people (famous or otherwise) to a dinner party who would you ask? Think I would invite Stephen King, J.K.Rowling, James Herbert, Carrie Fisher, and Ridley Scott. So many creative people in one room would be amazing, just imagine the conversation! I like sweet popcorn, it’s the best! NOM NOM NOM! My favourite sport is Tennis, I was so pleased when Andy Murray won the Olympic gold medal! It was also brilliant when Murray won his first Grand Slam at the US Open. This has been a great year for sport, the Olympics & Paralympics were fantastic, and I enjoyed watching every moment! 10. If the world was going to end and you only had time to tell one person that you loved them, who would it be? And why them? That’d be by mum, well, because she’s my mum. Now here are the questions for my nominees! 1: What is the scariest film you have ever seen? 2: Have you ever judged a book by its cover and been wong? 3: Say you had a Star Trek transporter, where on Earth would you beam to right now? 4: How would you pass the time on a long train journey? 5: If you could be a superhero for a day, who would you be? 6: Are you bothered about seeing a film in 3D? 7: Doctor Who has a TARDIS, which time & place would you like to visit? 8: Lots of Zombies are outside the house. Do you wait for help or try to escape? 9: Which Star Wars Trilogy is best: Prequel or Original? 10: If you had a chat show, who would you like to interview? I’d also like to thank the many other blogs and websites who have supported me with my blog Sci-Fi Jubilee, and all of my great followers on Twitter as well. I wish I could have nominated you all, but I could only pick 15 Blogs, so sorry I couldn’t include more of you. Cheers eveyone! Soon Gordon has a lot more to worry about than trying to hide his cigarettes from his daughter when the Police Station is plunged into darkness. The Joker stands in the doorway, his macabre madness concealed only by the flicking shadows of the emergency lighting. 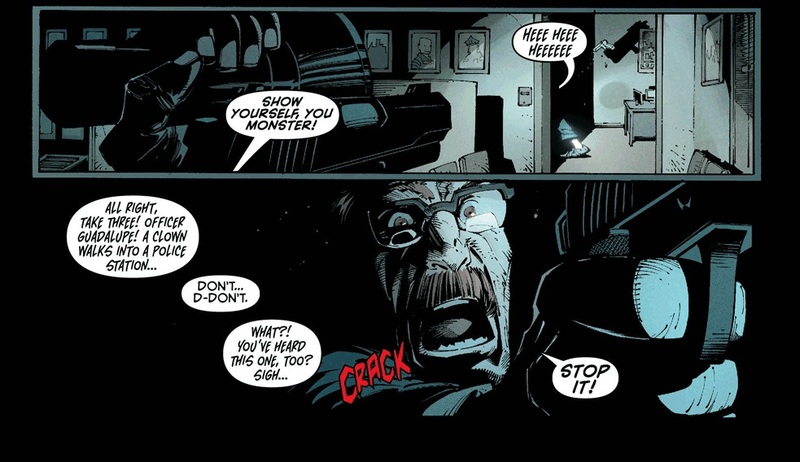 With his officers in disarray, Gordon can only watch and listen helplessly as the Joker systematically beaks each officers neck, taunting Jim from the darkness as his colleagues scream in terror. 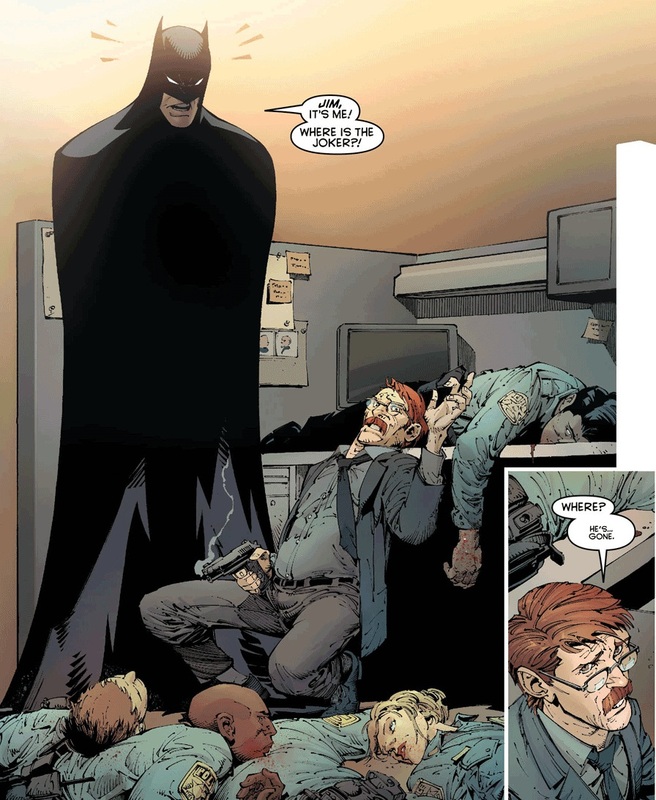 He stalks Gordon around the room, claming that Batman already has his calling card, before the lights come back on and Batman appears behind Gordon – who is now surrounded by the corpses of his murdered officers. But the Joker has gone, vanishing into the rain swept night having taken the remains of his face – which he’d allowed the Dollmaker to remove – from an evidence locker. Later in the BatCave the troubled Dark Knight is joined by Alfred and Damien as he tries to make sense of the mad design behind the Clown Prince of Crimes return. There is still the mystery of why the Joker would allow the Dollmaker to remove his face, before disappearing and spending nearly a year away from Gotham City. Bruce confers with Nightwing, Batgirl, and Red Robin by comlink, warning them that the Joker is back. But as they talk a TV News channel begins to show the Joker torturing a hostage, forcing him to announce the Joker’s return to Gotham, before he kills his victim and gleefully announces that the Mayor will also die at midnight! After his year long absence from Gotham City, the Joker’s return has become one of the most eagerly anticipated events in The New 52 range of Bat-Titles. They say that absence makes the heart grow fonder; here Scott Snyder turns that heart of insane villainy pitch black as he unleashes the Joker on Gotham City. I don’t think the Joker has ever been as horrifically malicious as he is during his attack on GCPD. The way he takes out a room full of armed officers in the dark is truly the stuff of nightmares, playfully snapping their necks in a sickening flourish of callous humour, and leaving Gordon cowering in a corner after knocking the Commissioners torch from his hand. This scene is perfectly pitched by Snyder, and in this brief moment, he makes us feel like a simpering child again – all alone and scared of the dark. The Joker’s horrific attack on GCPD! The live broadcast on TV where the Joker forces John Claridge – the son of one of the first people the Joker murdered with his lethal Joker Toxin – to announce his return to Gotham, before blowing his hostages brains out, gives us our first glimpse of this madman’s labyrinthine intellect. Joker also coldly compares his threat on the Mayor’s life to killing a baby bird with a crowbar – a suitably cruel reference to A Death in the Family for Batman. It is only later, when the Police Officers guarding the Mayor are slaughtered by a new Joker Toxin cunningly dabbed on their uniforms and activated by the detergents on the recently cleaned floor, that Batman finally begins to piece together the clues behind the Joker’s new obsession with his first crimes. Indeed, the twist of making the Joker’s “calling card” a joke is in itself a stroke of genius by Snyder, one that keeps the reader, and the Dark Knight himself, constantly on edge. It’s this new unpredictability that is so unnerving. Even Jim Gordon seeks a moment of reassurance from Batman when the two confer in an elevator just before the Mayor’s office is turned into a frowning bloodbath. In a way they both know the Joker so well now, each has been touched by the fear that he can instil in others, and they know the price of that fear if you’re foolish enough to show it. After tracing the clues in the new Joker Toxin back to A.C.E Chemicals Batman expects to find the Joker, instead he apparently encounters The Red Hood. Naturally enough, Batman sees through Harley Quinn’s disguise, but he is quite unprepared for being trapped in one of the vats himself. 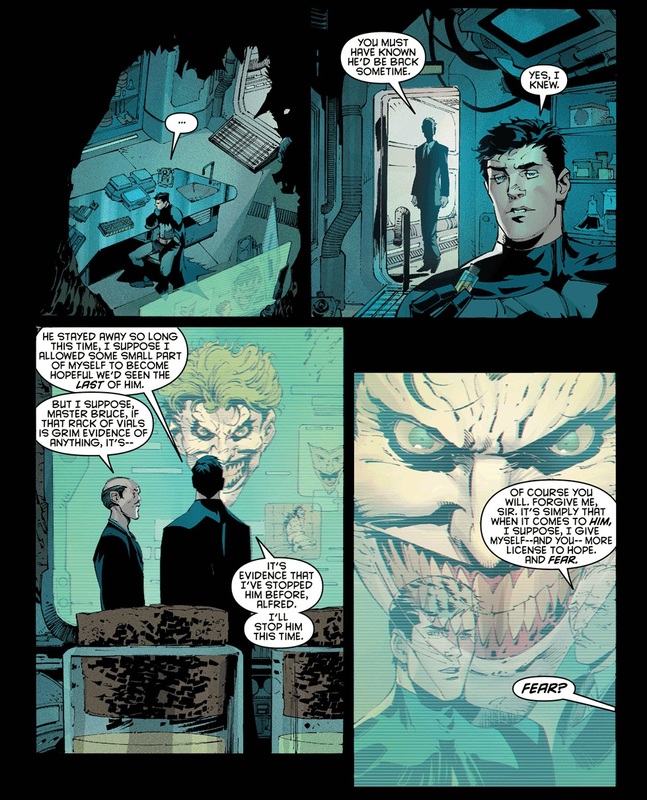 It is here, as the Joker mocks Batman for his failings against The Court of Owls – saying how it made him frown to see the Dark Knight falter against the birds roosting in his kingdom – that the Joker claims he has returned to save Batman, intending to make him strong again by killing his associates one by one. It seems that the Joker has been observing events from afar, watching and waiting for his time to strike. His mockery of The Dark Knights handling of the Talons assault on Gotham is particularly telling; and his disappointment with his old adversary’s reliance of his allies is a chilling example of how deranged the Joker’s twisted logic has become. Snyder seems to have the perfect handle on how the Joker actually thinks; giving the reader a ringside seat for the unfolding horror, almost supplanting the Joker’s giggling voice in your mind as you turn each page. Yet it is Capullo who makes Snyder’s vivid take on the character such a resounding success, even though Joker spends much of Batman #13 cackling from the shadows, using his victims like puppets as he draws Batman further and further into his deadly web of misdirection. Those final moments, where Alfred investigates the strange scratching sounds at the door of Wayne Manor and discovers the two headed lion cub on the doorstep, catapults you towards the horrifying climax as Alfred turns around and finds himself face to “face” with the Joker! We have been teased with Capullo’s new look for the Joker for months now. The first glimpse of the Joker reflected in Alfred’s eye is a distorted, fun house image, trapped in a mirror of gleaming horror before being revealed in its entirety as the Joker steps from the darkness of the hallway to attack Alfred with a hammer. It is rare that a horror film can make your blood run cold these days, let alone a comic book, but that final image from Batman #13 is as astonishing as it is unsettling. The Joker now wears his face like Leatherface from The Texas Chainsaw Massacre, strapped to his scalp, his hair flailing wildly in greasy clumps as he lurches towards Alfred. 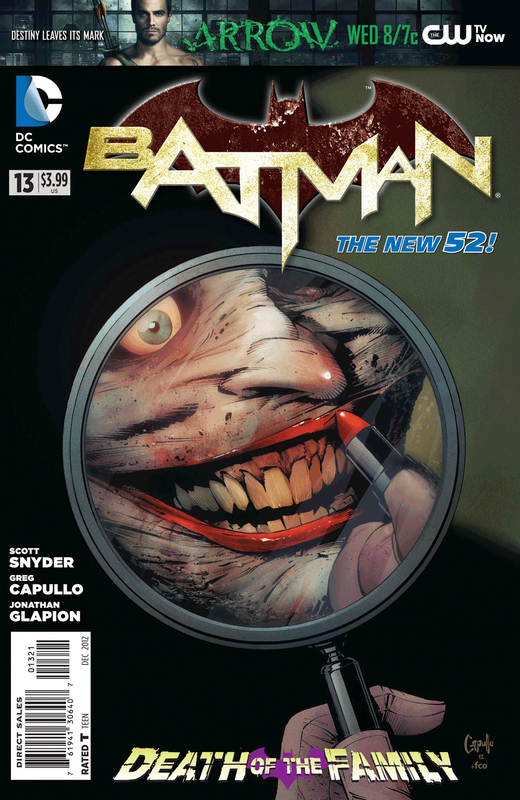 We have seen Alfred come face to face with Bane and The Court of Owls in his time, but there is something about seeing him alone in the Manor – with the Joker poised to strike him down – that makes this final page unimaginably terrifying. The two headed lion cub also serves as a grim reminder of the duality shared by the Joker and Batman, each born of Gotham, bound together by fate, and locked forever in a battle to destroy the other. As the Rot threatens to engulf Washington, Commander Kahn monitors the global crisis from deep within The World Army Command Centre. He is busy conferring with his superiors by video link when President Lightfoot is teleported to safety from The White House by Commander Dodds and his squad of “Sandmen”. With the President safe, Kahn is horrified to learn that a nuclear strike is being contemplated to deal with Grundy. Having witnessed a team of “new wonders” fighting the horrific creature, Kahn dispatched The Atom to help bring the situation under control, but with only twenty two hours left to stop the accelerated decay, a nuclear strike on Washington now seems inevitable. Grundy begins to reassemble himself and cocoons The Atom! 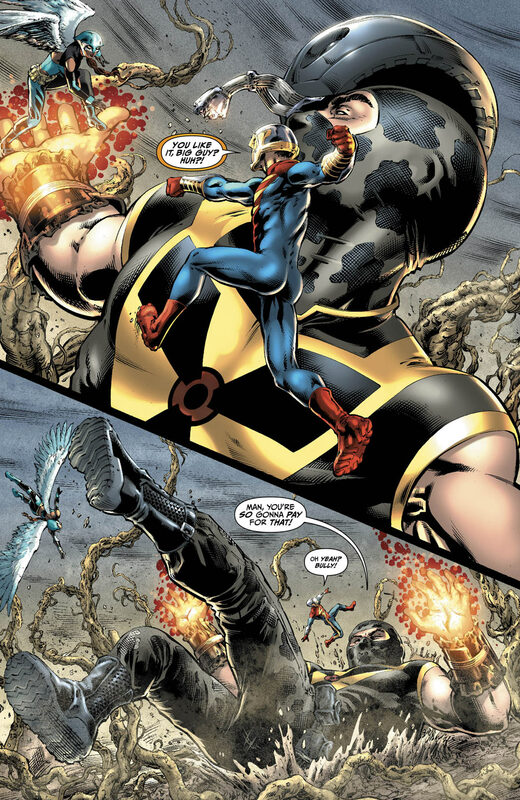 Having crushed Grundy to a pulp with his giant form, The Atom snatches Hawkgirl from the air and demands that Green Lantern and The Flash stand down. 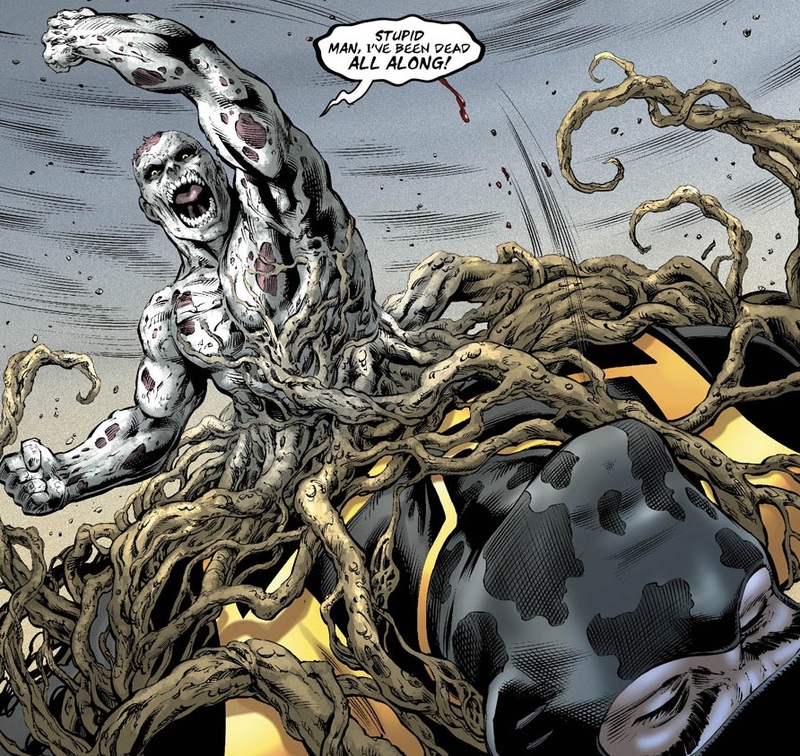 While the heroes quarrel spurs The Flash to launch a blistering attack to rescue Hawkgirl, sending The Atom crashing to the ground, Grundy begins to reassemble himself – cocooning the fallen giant in the snaking tendrils of the Rot. 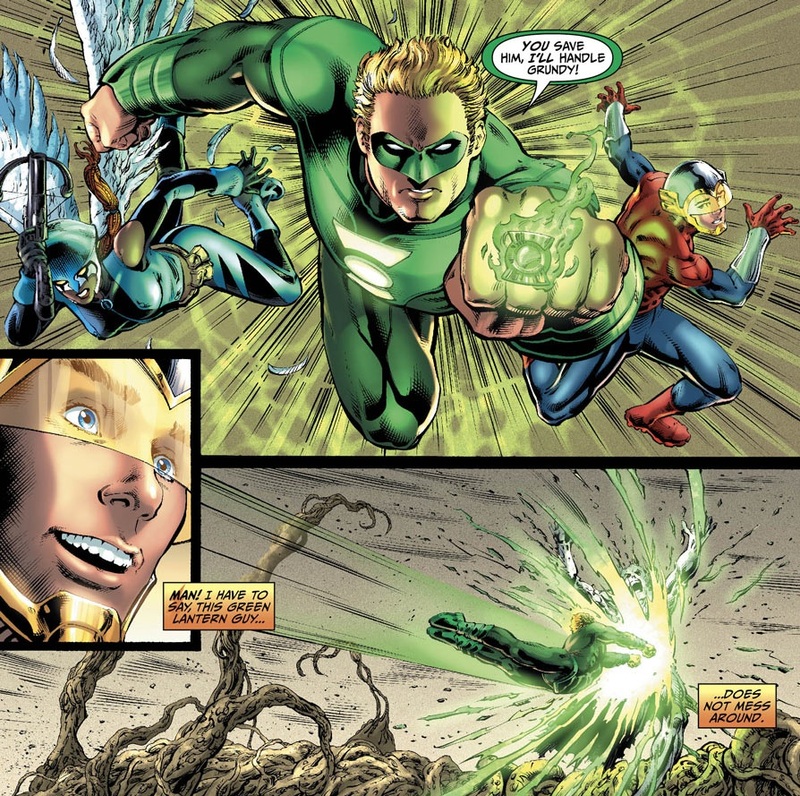 Green Lantern attacks Grundy, giving The Flash and Hawgirl time to free The Atom, but as they tear a gap in the tendrils they find that The Atom has shrunk back to normal size. 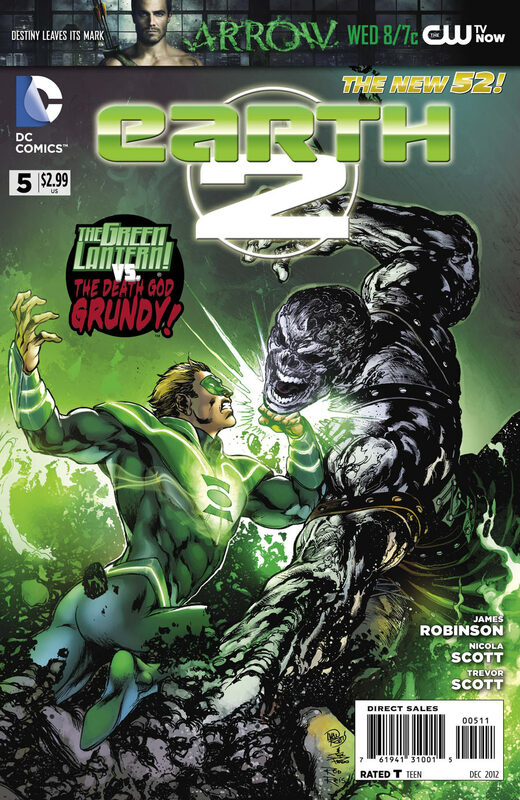 Unable to prevent Grundy from regenerating, Green Lantern suggests that he uses his powers connection to the Earth’s energies to strike at The Grey, relying on his new friends to protect him while he bonds his astral form to the internal matrix of the planet. The Flash, Hawkgirl, and Atom hold off Grundy as Green Lantern’s mind travels into the inner dimensional fabric of the Earth to face The Grey. Here he learns the horrific nature of this bizarre entities threat, to destroy a world it deems to be a failure and forge a new reality from its ashes. The Grey reaches out to Alan Scott’s mind, proposing an alliance with the Green Lantern, tempting him to betray the world with the promise that he will be rewarded with his hearts desire – the resurrection of recently deceased lover, Sam. But time is running out for the fledgling super team as The World Council overrule Commander Kahn, turning control of the operation over to the Terry Sloan, who calmly states that the time for debate is over. The World Council have already taken a private vote, and based on Sloan’s advice; the nuclear missiles are launched to destroy Washington before Grundy becomes unstoppable. With Issue #5 of Earth 2, James Robinson introduces us to The World Army Command Centre, and its commander – Amir Kahn. This is the first real chance we have gotten to see the inner workings of this organization. Commander Kahn has already deployed The Atom into the field, but he also hints that The World Army does indeed have other “wonders” at their disposal: including Commander Dodds and his squad of Sandmen, as well as Captain Steel who is currently on the other side of the world, and the tantalizing prospect of an unfinished Red Tornado. We already know that Hawkgirl is AWOL from The World Army, and that she has a history with The Atom, but her reasons for leaving and her relationship with The Atom is still a mystery at the moment. 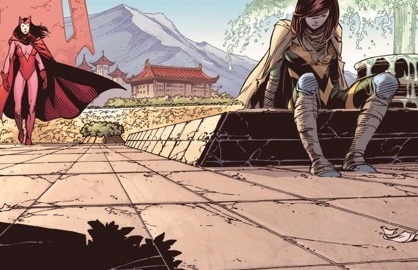 Kahn is vehemently opposed to the Worlds Council’s decision to appoint Terry Sloan as an advisor, particularly as Sloan was responsible for the devastation caused to his homeland during the Apokolips War, and his horror when he realizes the missiles have already been launched at Washington is almost palpable. The Flash also gets a chance to step up and prove his worth in Earth 2 #5, when The Atom knocks Green Lantern for six, Jay Garrick uses his super speed to knock The Atom over and free Hawkgirl from his clutches. We also get to learn more about the elemental, almost magical, nature of Green Lantern’s powers when he tires to communicate with The Grey. But it seems Alan Scott hasn’t bargained on how devious The Grey would be, as it offers him an alliance, promising to bring Sam back to life so they can be together again. We have already seen how powerful Green Lantern is against Grundy, although The Atom’s atomic energies seem to make him immune to Scott’s power ring, so it will be interesting to see how Alan Scott manages to resist the temptation of The Grey’s emotional bargaining chip. So far DC’s Zero Month has given us some intriguing prequel stories, offering an insight into the formative years of The New 52. The Fury of Firestorm The Nuclear Men #0 has taken a different approach, using the opportunity provided by Zero Month to act as fitting coda for the current storyline, whilst paving the way for a band new beginning for Firestorm. A year ago High School students Ronnie Raymond and Jason Rusch were attacked by terrorists and transformed in a freak accident by Professor Martin Stein’s Firestorm Protocols, the powers of Firestorm was divided between them, with physics student Jason acquiring the ability to transmute matter, while the football team’s star quarterback Ronnie became able to throw nuclear bolts of flaming energy. Together the two Firestorm’s were able to merge into one giant being, Fury, but found this ferocious creature almost impossible to control. Ronnie and Jason where then taken in by Zithertech, the mysterious company responsible for enforcing the Firestorm Protocols, but after being unable to settle their differences Ronnie decided to leave – and was quickly captured and tortured before falling under the corrupting influence of the Russian Firestorm Pozhar. Professor Stein’s Firestorm Protocols have also been adapted and sold to other governments around the world, allowing them to create their own Firestorms. Terrorist organizations have also stolen the technology to spawn Rogue Firestoms from the protocols, using them as the living weapons of mass destruction. Pozhar is secretly behind the Rogue threat; the Russian Firestorm tricks Ronnie to take control of his powers – forcing them to become the monstrous Scorn. Armed with the uncompromised formula created by the disembodied conciseness of Professor Stein, Jason races to rescue Ronnie – teaming up with his fellow Firestorm’s, Firehawk, Hurricane, and Rakshasi for a long and terrifying battle with Scorn. During the conflict, the Firestorm Protocols are rescinded by the Director of Zithertech, stripping the global network of Firestorms of their tremendous powers and killing them in the process – all except Ronnie and Jason. In a last ditch attempt to save his friend, Jason prepares to uses the canister of uncompromised Firestorm Protocols, and with Firehawk’s help, they destroy Pozhar, sacrificing their own powers in the process. Firestorm #0 opens with Jason and Ronnie as they adjust to having a normal life back in High School. Ronnie is enjoying his newfound freedom, spending time with his friends, while hoping to forget his life as a superhero so he will be able to commit to a college football program. Jason, on the other hand, is beginning to miss the powers he once had, but when a science experiment has some unexpected results, he realizes the Firestorm Protocols might not be dormant after all. When Jason tells Ronnie that he thinks their powers could be returning, Ronnie wants nothing more to do with his life as Firestorm, and tells Jason he should forget about it and do the same. 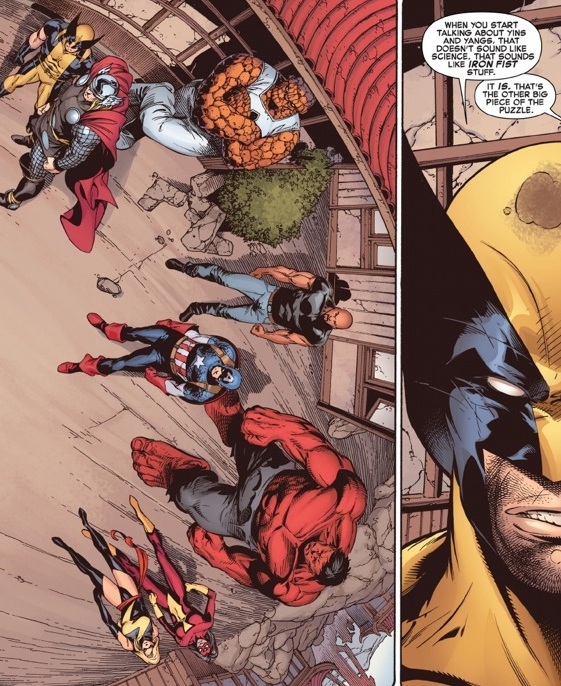 But their lives as Firestorm are far from over. 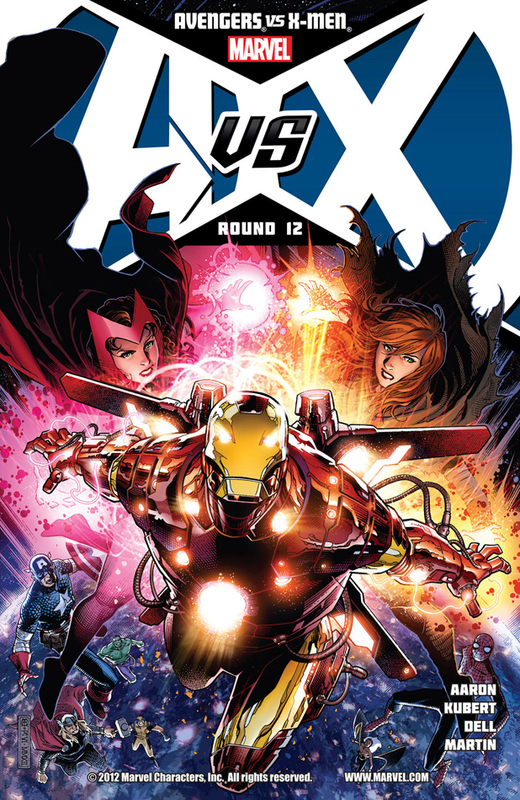 When the High Schools football game is attacked by the Zitherteck prototype Helix – who they believed to be dead – Ronnie and Jason are suddenly and inexplicably transformed into a merged Firestorm! 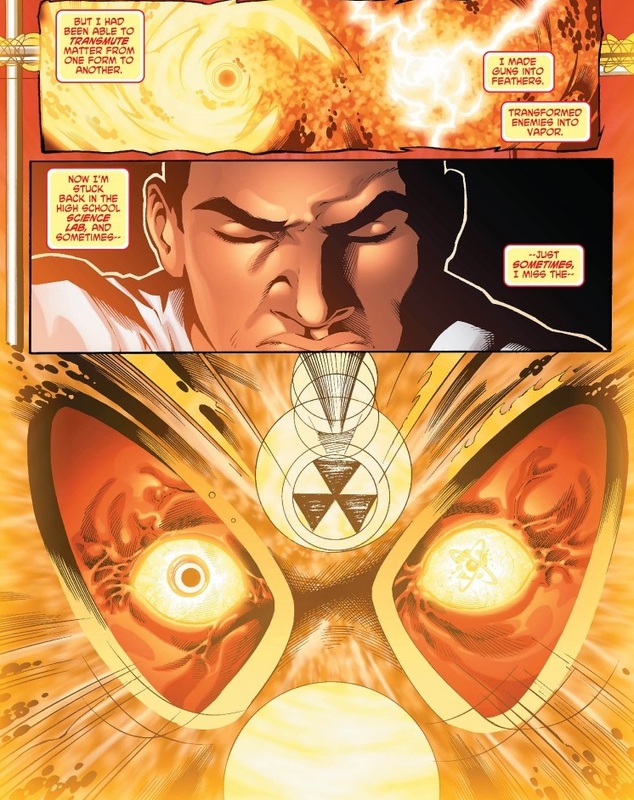 It seems that Ronnie is now the physical aspect of Firestorm while Jason has become an ethereal part of his mind – providing his scientific advice and transmutation skills telepathically – leaving Ronnie to harness the raw power of their combined Firestorm Protocols. Helix has been drawn to the football game by Ronnie and Jason’s latent energy signatures, but he didn’t expect to see them merge and become a new Firestorm. Still reeling from his sudden transformation into Firestorm, Ronnie is quickly overpowered by the lumbering Helix. Trapped in Helix’s deadly stranglehold, Jason quickly helps formulate a plan – transmuting the Nitrogen and Oxygen in the air, along with other trace element, to form a solid sphere around Helix that cuts off his oxygen supply and quickly shrinks and deconstructs the behemoth. Firestorm then flies into orbit where Helix’s atomised remains explode, sending the newly whole and complete Firestorm cashing back to Earth. Ronnie and Jason later regain consciousness on a hillside, having reverted back to their individual human forms. Together they realize that the Firestorm Protocols are now their shared responsibility; and that their lives are once again inexorably entwined as Firestorm The Nuclear Man. Firestorm returned in September 2011 as part of The New 52 reboot of the DC Universe, co-written by Gail Simone and Ethan Van Sciver. Unfortunately Gail Simone left the title only a few months later, she was then replaced by Joe Harris, but not long after his appointment Van Sciver also left Firestorm. 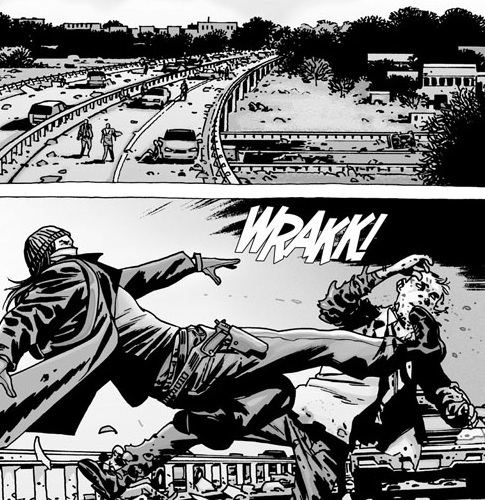 These creative changes in the writing team didn’t initially help the title achieve a real sense of consistency, at least until Harris began to draw together the various storylines that had already been established to form a more coherent plot, one which would steer the title towards a thrilling finale that involved the entire global network of Firestorms. 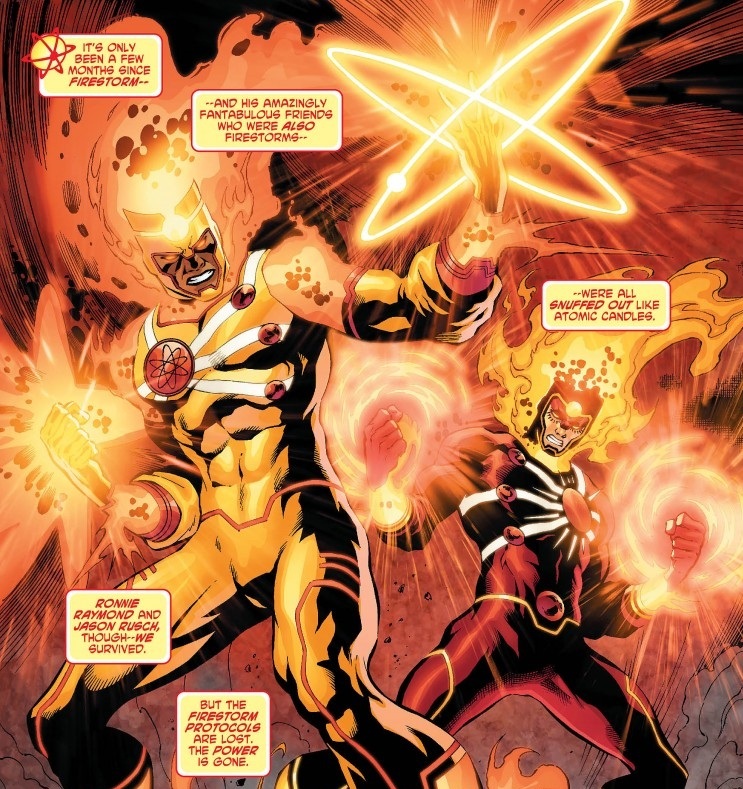 Yildiray Cinar‘s artwork on Firestorm has also been outstanding, creating a distinctive look for Ronnie and Jason as Firestorm, each with their own unique abilities, as well as the colourful supporting cast of international Firestorm operatives from around the world. Firestorm is a real powerhouse of a character, and has some tremendous abilities. Yildiray Cinar’s art has really captured the furious essence of his nuclear powers, and at times Firestorm almost seems to explode from the page! This Zero issue of Firestorm sees Joe Harris and Yildiray Cinar at the end of their run on Firestorm, with a story that throws Ronnie and Jason together again as Firestorm – literally this time – to restore the original concept of Firestorm which will be familiar to long term fans of the character. Joe Harris confidently helps usher in this new direction for Firestorm, making this a perfect jumping on point for new readers as well as enticing people back who didn’t enjoy the initial direction the series took. Firestorm #0 also allows Yildiray Cinar the chance to realize a new and more definitive version of the Firestorm costume, melding the red and gold outfits that Ronnie and Jason have worn into one that more closely resembles the original Firestorm costume. 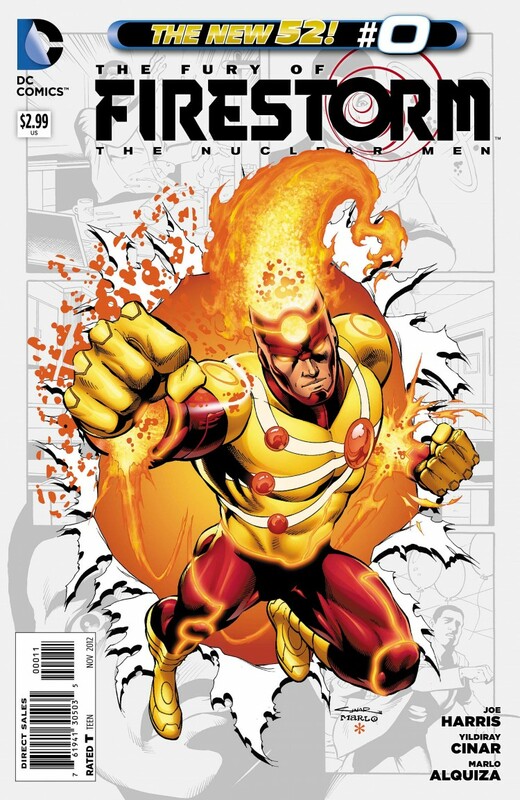 The Fury of Firestorm The Nuclear Men will be taking a whole new direction this October when Dan Jurgens takes over as the new writer / artist for the series. Jurgens was involved last year with The New 52’s reboot of Green Arrow and Justice League International, issue #13 of Firestorm will effectively relaunch the series, beginning a new chapter set in the everyday High School lives of Ronnie Raymond and Jason Rusch as they learn to work together again as Firestorm. We can expect to see plenty old and new villains for Firestorm to deal with, as well as a guest appearance from Captain Atom. Editors Rachel Gluckstern and Ricky Purden join Dan Jurgens, along with inker Ray McCarthy and colourist Brian Miller as part of the new direction that will spin out from the pages of the excellent Firestorm #0, and with the exciting new chapter about to begin in Firestorm #13, there has never been a better time to revisit the adventures of Firestorm The Nuclear Man.